"When we wander, wander, wander far away from you"
Welcome, Perkiomen Alumni! Perkiomenites are a proud, diverse, talented group of people who reside around the globe. Alumni are currently living in 58 countries, 47 states, the District of Columbia, three territories, and right here in Southeastern Pennsylvania. Reflecting on your time at Perkiomen might bring to mind the people and places that made your Perkiomen experience uniquely yours. Which faculty member was most inspiring? Which dorm did you call home? Did you have a favorite meal in Parents Hall? Each of us had connections that shaped our years at Perkiomen. We would love to hear about yours. Being an alum of Perkiomen provides you with many opportunities. I encourage you to connect with the Perkiomen of today. Attend events in your area or on campus, read about our students and faculty in our publications, reconnect with classmates and faculty at alumni weekend, nominate someone for an alumni award, come to a play, game or concert, volunteer to be a speaker, mentor, or host an event. There are so many ways to stay involved and support Perkiomen. I welcome the opportunity to engage with you on how you can be a part of Perkiomen today and celebrate the amazing history of this outstanding school so many of us call home. Click here to send us your updated address and a class note for the Perkiomen Magazine. Headmaster Mark Devey will share the latest news on Perkiomen, including exciting future building projects. Join us to reunite with your classmates and reminisce about your days on campus, network with fellow alumni, and rediscover what your Perkiomen family means to you. We look forward to your company! Headmaster Mark Devey will share the latest news on Perkiomen, including exciting future projects. 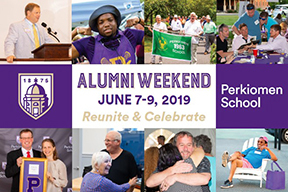 Join us to reunite with your classmates and reminisce about your days on campus, network with fellow alumni and rediscover what your Perkiomen Family means to you. Headmaster Mark Devey will share the latest news on Perkiomen, including exciting future projects.Join us to reunite with your classmates and reminisce about your days on campus, network with fellow alumni and rediscover what your Perkiomen Family means to you. Perkiomen has some exciting news! We are launching PerkCommunities..so what’s the buzz about? 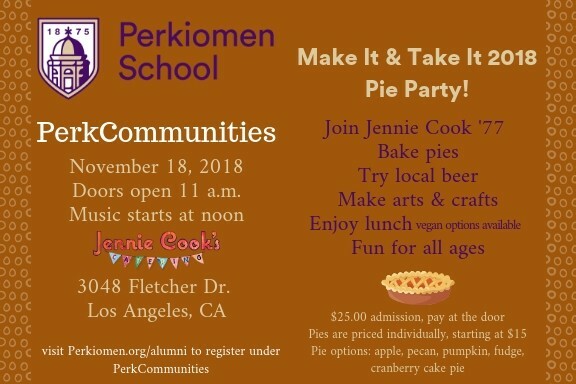 Come meet your fellow Perkiomenites next door! Want to get together for a local event? Maybe organize a Perkiomen team for a day of service? Meet for a concert or maybe a happy hour? The possibilities are endless. We are looking for you to be inspired to create your own event and be the host! How can you help? Well, we are excited that you asked! Submit your proposed event to the Perkiomen’s Office of Alumni and Development. It’s that easy! We will still host our traditional alumni events like area gatherings and alumni weekend, however, this provides a chance for you to pick an activity, and a place to meet. The Alumni E-Newsletter, sent monthly by the Office of Alumni and Development, will allow you to connect with all things Perkiomen: alums, events, and news. Our hope is that these stories will allow you will engage and define what Perkiomen means to you. Please share your e-mail address with us to receive this monthly electronic publication. Between editions, read our blog for additional campus and alumni news. The Office of Alumni and Development is pleased to recognize Perkiomen’s most outstanding and influential alumni each year during Alumni Weekend. The Alumnus/Alumna of the Year Award is presented for service to Perkiomen School. The recipient shall be one who, through unselfish interest, loyalty, or personal commitment, has enhanced the quality of life in the Perkiomen School community and promoted the prestige of the School. The Alumnus/Alumna of the Year Award recognizes someone who has served Perkiomen School from their heart with their time and talents. The first award was given in 2006 to Jim Schulz ’81 P’02,’11, who inspired the Alumni Council to create this award. The Young Alumni Achievement Award is given for outstanding achievement in a chosen field. The recipient shall be one who has brought honor to him or herself and Perkiomen School by achieving recognition and respect within their field. An alumnus/alumna must be nominated by a member of Perkiomen School community and have graduated within the last 25 years. The Honorary Alumnus/Alumna Award is presented in recognition of one’s valuable service to the school or interest shown in its progress and welfare. One of the first accomplishments of the Perkiomen School Alumni Association when it was first founded more than 110 years ago was the establishment of the Honorary Alumnus Award. The Association established this award within its first year of existence. The first award was presented in 1896, and to date, over 106 individuals have been so honored. The Distinguished Alumni Award is presented for outstanding achievement in both of the following areas. Service to the Community: The recipient shall be one who has brought honor to him or herself and to Perkiomen School by service to others at a local, state, national or international level. Outstanding Achievement in a Chosen Field: The recipient shall be one who has brought honor to him or herself and Perkiomen School by achieving recognition and respect within a chosen field. A member of the Perkiomen School Community must nominate an alumnus/alumna. The Carl Pfrommer Distinguished Service Award, formerly known as the Perkiomen Key for Distinguished Service, represents the highest honor the school bestows upon one who has given continued support to Perkiomen and has been willing to give his or her time, energies, and talents insofar as location and opportunity have permitted. The recipient will have contributed significantly to the civic, governmental, religious, educational, social, industrial, business, or professional life of the nation, state, or community. in most instances, shall subsequently have gained outstanding success in their respective sports at college or professional levels, as reflected by objective performance data (when available), won-lost records, championship titles, all-star team selection, etc. (while specific guidelines are not indicated) it is intended that all candidates considered for membership shall epitomize responsible citizenship and good sportsmanship, and shall have gained recognition as truly superior performers in their respective sports. Coach – Membership shall be granted to The Perkiomen School coaches who have demonstrated strong moral leadership and outstanding coaching expertise in one or more sports as reflected by the performance records of their teams and/or significance in the eyes of those coached. Former athletes who subsequently pursue coaching careers in school, college, or professional ranks shall be eligible for membership consideration in accordance with the criteria outlined in the preceding paragraph. As in the selection of athletic members, the intent in this category is to recognize only those who have achieved truly outstanding success in the coaching field. Contributor – This category of membership shall serve to provide appropriate recognition for those who make truly significant contributions to The Perkiomen School athletic program in capacities other than athlete or coach. Conceivably, this type of membership would be available to school physicians and others who contribute beyond the call of duty to the success of the program. Team managers, sports officials, and journalists would fall into this category, as would financial contributors with special interest in athletics. Guidelines, while deliberately general in language, are intended to confine selection to those whose contribution is truly outstanding. Nominations for election to membership may be made by members of the Perkiomen School community. Nominations must be submitted in writing with complete and accurate supporting documentation to the attention of the Director of Athletics. A committee comprised of the director of athletics, director of alumni affairs and a Perkiomen alumnus will review the nominations and will vote on the nominees. Those elected will be subject to approval the headmaster. Induction of those elected to the Hall of Athletic Honor will take place at the Annual Alumni Weekend at Perkiomen School. Inductees, or their representatives, will be presented with an appropriate memento in recognition of their election to the Hall of Athletic Honor. Inductees will have their names permanently displayed in the Hollenbach Athletic Center. The Ralph Hossman Award is presented to the alumnus/alumna who has overcome life impairing conditions or adversity, and who through fortitude and determination refused to fail, thereby providing an inspiration and example to all of us. Perkiomen’s volunteer programs are designed to strengthen the bond between the school and its alumni and parents. There are opportunities for those living locally and around the world. If interested in learning more about any volunteer opportunities, click here or contact Diana Weir-Smith ’85, P’19. Perkiomen depends on the philanthropic gifts of alumni, parents, grandparents, and friends. Each year, Perkiomen solicits support specifically from our alumni community and we would appreciate your help connecting with them. You can volunteer to encourage alumni to give, share your story about why supporting Perkiomen is important to you, call to thank donors, or add a personal touch to our letters. Your connections will make a difference and any time commitment – short or long – will be worthwhile. Consider organizing and hosting a casual Alumni Meet-up in your hometown. In addition to our regular Alumni Gatherings, we are encouraging alumni to host informal events for fellow alumni all over the world. If you have access to a special venue or experience, we’d love for you to welcome alumni to join you, reconnect and network. Giving back to Perkiomen is so easy for college students! Join the “How to Succeed in College” Panel planned for January 4, 2018. Alumni in college and graduate school return to campus to share their experiences and discuss a wide range of topics related to college life. Share your infinite wisdom, while giving back to Perkiomen. Time commitment is approximately one hour, followed by lunch. Perkiomen is looking to connect professionals with our students in the entrepreneur program. Be a mentor, collaborate with students on projects, offer internships, be a sounding board or offer visits to your place of business. If you don’t live locally you can still participate. Today’s young alumni are facing a challenging work environment and are looking for career advice and a guiding hand in finding internships and job placements. The Alumni Office will work to match young alumni and alumni mentors based on common professional interests. Mentor and mentee applications are available below. Once a mentor and mentee have been matched, they will make their own arrangements for meetings and conversations. Click here for Mentor/Mentee application. Established in 2013, this program seeks to connect alumni involved in the fields of science, technology, engineering, art, and math with current students and others in our community. During class and evening lectures, alumni have covered a variety of topics including aerospace and rocket engineering, statistics and laboratory methods, genetic causes of inherited blindness, disease mutation, and nuclear engineering. You can also connect with classes via SKYPE if your location prevents a visit to campus. Great faculty aren’t just located on Seminary Street. By bringing distinguished alumni to campus Perkiomen broadens the educational experience of our students and the community. Be a part of this group of as we welcome our smartest, most engaging, and influential alumni to campus, to encourage thought-provoking conversations and ideas as we risk becoming our best. Perkiomen endeavors to have the most up-to-date information on our entire alumni community. To keep the connection with Perkiomen strong, our alumni and professional databases must be current. Alumni data volunteers can work from anywhere in the world to help update Perkiomen’s database. The gathering of current email addresses is especially important so that alumni can receive invitations, reunion news, and the Alumni E-Newsletter. Share with others why you support Perkiomen and help others follow your lead. Testimonials are helpful in personalizing the Perkiomen experience and not only help with fundraising, but are crucial for admissions and retention. Your thoughts may be shared in print and online, and the length can vary from a few sentences to a full article. The Perkiomen School Parents Association offers a variety of ways for parents from all over the world to be involved with the school community. Click here for more information. What's new with you? By completing the form with the correct contact information, Perkiomen is able to provide you with the latest news and invitations. When you complete a class note you are informing Perkiomen and your classmates about your life events. There is a nominal fee of $5.00 per transcript and a transcript request form needs to be mailed, emailed as a pdf attachment, or faxed to the registrar. If a transcript needs to be sent to some other party, then a written transcript request form is required (this must be done via postal mail or in person). Once a student has attained the age of 18, the registrar will not send transcripts to third parties at the request of parents. That request must come from the student. Please include the name(s) of school(s), address(s) and phone number(s) to where transcript(s) are to be mailed. We will mail the official transcript(s) within two to three business days of receiving the form, mailing address(s) and fee. If you request that the transcript(s) be mailed via Federal Express there is also an additional charge of $75.00 (international) or $30.00 (within the United States) per FedEx envelope/package. Checks/money orders should be made out to Perkiomen School and mailed to the address listed above. Along with the check please include the transcript request form. Please contact the Business Office at (215) 679-1138 and give them the credit card information.